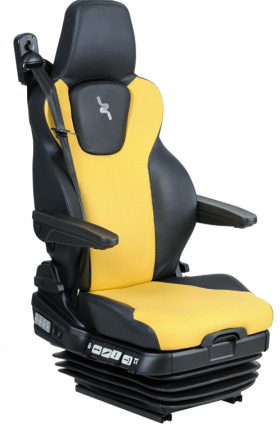 The BE-GE 30 Series Ergo seat is the ultimate in driver comfort ergonomics and durability. It provides all the support a driver needs and includes the sleek look of the European seats. It features Air Operated Slide Rails, Air Operated Shoulder Support, Adjustable Seat Belt Shoulder Height, Infinite Adjustable Shock Absorber, Dual Air Lumbar and Air Operated side bolsters as well as seat and cushion length adjustment and is available in grey cloth trim. Options include leather trim as shown, Air Ventilation and Cooling System and Air Operated Turntable. Suitable for Kenworth and flat floor trucks.